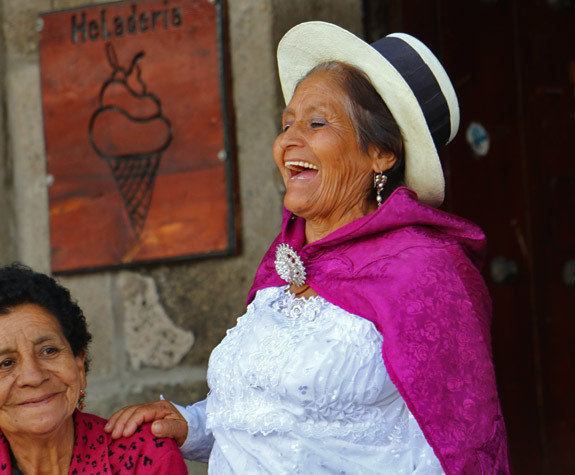 Peru is home to an incredible diversity of cultural traditions and religious celebrations. From solemn religious pilgrimages to celebratory festivals, there is something interesting happening every month of the year. 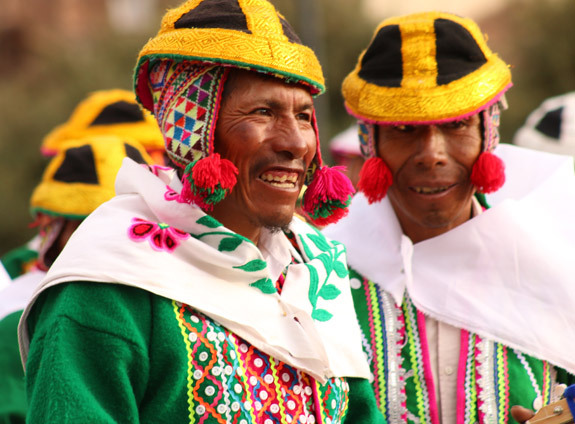 We strongly encourage you to incorporate a cultural event in your visit to Peru. Take advantage of these excellent opportunities to experience the traditions that make Peruvian culture and religion so fascinating. Our Peru cultural events calendar is an excellent reference point for including an event in your Peru tour. Ayni Peru is happy to incorporate any of the events mentioned below in your custom itinerary! Jan 1 Throughout Peru: Año Nuevo is the marking of the beginning of the new year. Like in the rest of the world, friends and family come together to celebrate this transition. It´s a national holiday, so expect most businesses to be closed. Jan 5-8 Ollantaytambo, Cusco: Bajada de Reyes (The Epiphany) commemorates the arrival of the Three Wise Men with baby Jesus. The festival features a procession, traditional dances, costumes, and food. Jan 18 Amantani Island, Lake Titicaca: Fiesta de la Santa Tierra gives gratitude to Mother and Father Earth. Today the two temples of Amantaní are open, and the town visits both. Villagers partake in important rituals that pay respect to the earth. Jan 20 Canas, Cusco: Chiaraje is a reenactment of war battles. 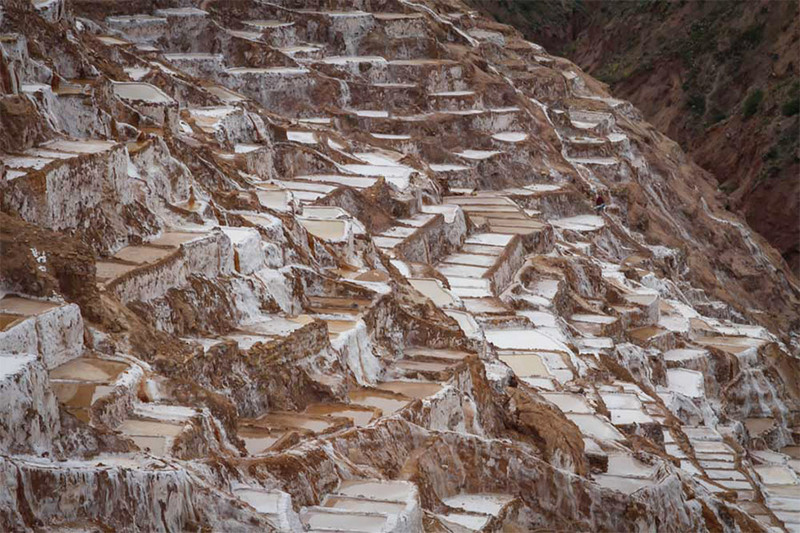 It is meant to give life to Pachamama, and is a ritual for fertility. Jan 20 Cusco, Cusco: Festival of San Sebastian is a colorful religious celebration. Señor San Sebastian is carried through the streets in procession, accompanied by traditional dances, music and food. Feb 2-18 Puno: Virgen de Candelaria is one of the most famous religious events in Peru. It honors the patron saint of Puno, the Virgin of Candelaria. The festival lasts two weeks, and numerous musical groups perform all over the city. Feb (dates vary by year) Throughout Peru: Carnaval is celebrated in all of Peru during the month of February with water-fights in the streets, music and dances. The best place to be during Carnaval is Cajamarca, in Peru´s north. In addition to water-fights and music, locals do a traditional dance around the ‘yuca’ tree that is hung with presents. Late March-Early April Semana Santa, the Holy Week leading up to Easter, is celebrated in all of Peru. Processions, music, dance and street events characterize the week. The best place to partake in these festivities is Ayacucho. April 2: Señor de los Temblores is an important procession where the image of Christ is carried through the streets of Cusco. The figure is believed to have stopped the infamous earthquake that hit Cusco in 1650. April 15-20 Lima: The Peruvian Paso Horse Festival shows off the national horse breed of Peru in a 5 day dressage competition. Every day ends with a party where the traditional Marinera is danced. May 1 Arequipa: Virgen de Chapi is a 45 km pilgrimage from Arequipa, to the Sanctuary of Virgen de Chapi. Thousands partake each year, to worship the image of Virgen and celebrate with music, dance and fireworks. May 2-10 Huaraz, Ancash: El Señor de la Soledad commemorates the patron saint ‘The Lord Of Solitude’ with dances, prayers and lantern processions. May 3 Cusco, Cusco: Cruz Velacuy honors the cross on which Jesus was crucified with processions and colorfully “dress” stone crosses outside local churches with robes, flowers and candles. Pentecost Sunday Ollantaytambo: Señor de Choquekilka honors Ollantaytambo’s patron saint with colorful costumes, traditional dances, a bullfight and lots of fireworks. Late May (date varies) Ausangate, Cusco: Qoyllur Riti worships the spirits of the mountains at the base of Ausangate. Ten thousand pilgrims come here to join the rituals and enjoy the performances of dancers who represent mythical creatures. Late May (date varies) Cusco, Cusco: Corpus Christi honors the Holy Eucharist and is one of the biggest religious festivals of Cusco. Fifteen saints and virgins are carried through the streets in a parade accompanied by music groups and marching bands. Early June (date varies) Canas, Cusco: Festival of Q’eswachaka honors the Inca ancestors by reconstructing one of the last woven bridges that hang across the Apurimac River. The three day celebration begins with the removal of last years bridge, and continues as the new bridge is woven and hung. The final day is marked with dancing and celebration. June 24 Cusco, Cusco: Inti Raymi, or the festival of the sun, is the most famous festival in Peru. It celebrates the winter solstice with a reenactment of the ancient Inca ceremony on the same day. In an impressive procession marked with dances, speeches and colorful costumes, the Inca makes his way to the Saqsayhuaman ruins for a stunning ceremony. June 24 Ayacucho: Chaccu is the gathering of thousands vicuñas in the reserve of Pampa Galeras- Bárbara D’Achille in order to collect their valuable fur. After the sheering they are released again and the people celebrate with traditional food. June 29 Lima & Chiclayo: Dia de San Pedro y San Pablo. San Pedro and San Pablo, the patron saints of farmers and fishermen, are honored with a procession. Their images are carried to the sea, accompanied by incense, hymns and prayers to bless the water. June 29 Ollantaytambo, Cusco: Festival of Ollantay Raymi tells the forbidden love story between Ollanta, an Inca general, and a royal Inca daughter in a performance in the Ollantaytambo archaeological site. July 15-17 Paucartambo, Cusco: Fiesta Virgen del Carmen is the most boisterous, celebratory festival in Cusco, filled with dancing, rowdy performers, food and drink. The festival honors patron Saint Virgen del Carmen, and on the principal day she is carried through town to bless the people and scare away demons. The procession ends at the cemetery to pay respect to the dead. July 28-29 Fiestas Patrias, or the Peruvian independence day, is celebrated with parades, concert throughout Peru. Aug 1 Cusco: Año Nuevo Andino (Andean New Year) spans all of August and marks the beginning of the agricultural growing season. The month is dedicated to Mother Earth (Pachamama) with ceremonies of payment in her name (Pago a la Pachamama). Aug 2 Cusco, Cusco: Corpus de San Cristobal is dedicated to all people that work in transportation. It’s celebrated with processions, music and Chiriuchu, Cusco´s traditional meal of celebration. Aug 30 Lima: Santa Rosa de Lima honors the patron saint of police and armed forces with processions in the capital city of Peru. Sept 8 Cusco, Cusco: Corpus of Almudena is another religious holiday celebrated at Cusco´s oldest church, with processions, regional dances and Chiriuchu. Sept 14 Sacred Valley, Cusco: Señor de Huanca is a pilgrimage to the Sanctuary of Señor de Huanca, where the image of Christ is believed to have appeared numerous times, to receive blessings. Late Sept. Cusco, Cusco: Warachikuy reenacts the challenges boys had to overcome in Inca times to become men. After successfully completing these physical tests, boys were able to marry and become citizens. Oct (date varies) Lima: Mistura is one of the most important gastronomic festivals in Latin America. Chefs from all over the country come together to serve their food in an enormous gathering. Early Oct Quispicanchis & Canchis, Cusco: Virgin of Rosario honors the patron saint of the towns Urcus, Combapata and Checacupe with bullfights, fairs and of course processions. October 21 Ica: Señor de Luren Festival remembers the mysterious disappearance of the patron saint of Ica, a wooden sculpture of the crucified Christ. 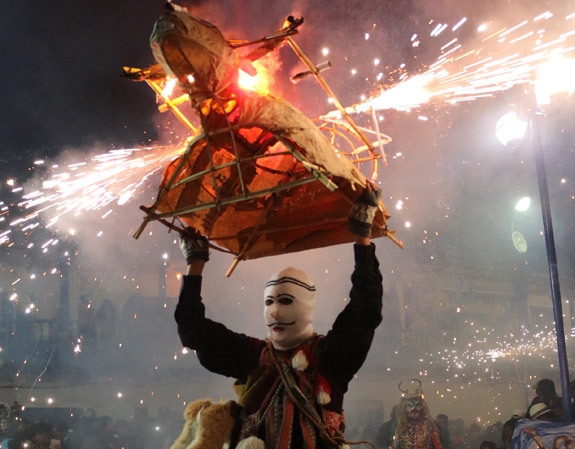 During this Festival a replica is carried in a procession from dusk till dawn the next day. Nov 1 & 2 Throughout Peru: Dia de Todos los Santos and Día de los Muertos are two days dedicated to remembering the dead. This is done with family, special food (bread in the shape of dolls and horses) and a visit to the cemetery to celebrate with loved ones that have passed away. Nov 1-8 Puno: Puno Week is an entire week dedicated to Manco Cápac, who is said to have risen from Lake Titicaca to establish the Inca Empire. It’s a week full of music and dancing and a lot of drinking. Dec 24 Cusco, Cusco: Santikuraray is a temporary market in the Plaza de Armas. It attracts hundreds of artisans to sell handcrafted Nativity scenes, ceramics, carvings and plenty more. Dec 24 Throughout Peru: Navidad, or Christmas, is celebrates tonight with family. As you can see from our Peru cultural events calendar, almost any time of year provides opportunities to experience the country´s diverse and fascinating traditions!